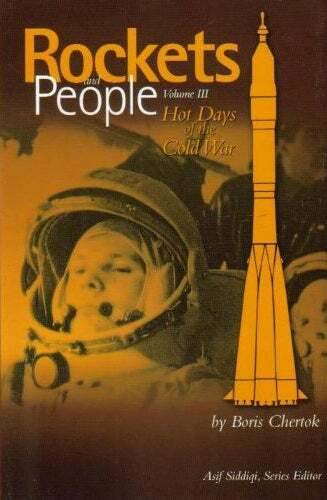 Academician Boris Chertok's four-volume remembrances, Rockets and People, were translated into English by NASA between 2005 and 2011. As paper books they'd be massive, each more than 400 pages, but they seem to have been printed only in limited numbers, and they are available as free ebooks on the site of the NASA history program (Volumes 1 and 2 as PDF only; 3 and 4 as PDF, .epub, and .mobi). For this review I read much of the first volume. How the son of a midwife and a bookkeeper rose from amateur radio engineer to factory electrician to head of ground control for early manned space flights could easily be an epic yarn. But unfortunately for those of us who are not historians of the Soviet aerospace program, that is not how Academician Chertok approached his memoirs. His very first chapter is a dense and nearly Biblical litany of the bureaucracy responsible for the program. It's a rough start for a reader, full of department names and obscure references to jet engine technologies. Bored, I skimmed the first half, but after a few minutes it dawned on me I'd seen the word "executed" quite a lot in between "People's Commissariat for Heavy Industry" and "People's Commissariat for Ammunitions." Retracing my steps, I learned the Soviet aerospace program might have progressed more quickly in the early years, had the higher-ups not systematically murdered the chief engineers. Chertok pauses here in his litany of departments, just for a moment. You can almost see him, an old, old man, steeped in the vocabulary of Soviet efficiency, gazing off into the distant past and considering how best to proceed. He writes, finally, with delicate irony, "The behavior of leaders in a totalitarian state does not always lend itself to explanation from the standpoint of common sense." Read more of Greenwood's review, and find out about this extraordinary (and nearly forgotten) scientist at Download the Universe.